It's the time for thistle down. Many of the thistles here are tall. Their heads stick right above the nettles and brambles. And show bright and beautiful against the green backdrop of blackberry leaves. And are left behind when their seeds are gone with the wind. Away from the hedgerow, there a some free standing, sedate and dramatic thistles. Thistles which are like bushes in their own right - where the bees were busy in the summer, creating the down. Thistles stark with the patterns of autumn. This is what the plant in the last two pictures looked like in the summer (below). Probably Spear Thistle (Cirsium Vulgare) - More like a bush than a plant, it's so big! "Gone with the wind"... I like that phrase. Somehow seems very final, though in the case of the thistledown it's obviously not - just an opportunity for a new beginning. It's exciting, isn't it, Mark? Seeing all this potential. Also reassuring - shows how many seeds, thank heavens, never grow into new plants. The last plant is about the same height as me and twice as wide. All those seeds! They'd turn into a veritable army if they all came to something. One character in the book 'Jonathan Strange and Mr. Norrell' is only ever referred to as the man with the thistle down hair. He has something of the thistle's quality; beautiful yet ominous. A bit different but still so beautiful! I love the architecture of thistles, and that lovely, contradictory mixture of the sharp and the soft. Your pictures of thistledown are so beautiful. I love the brown autumn picture of them such a contrast to earlier in the year. I have these thistles in my meadow and ouch can they dig right through clothing to skin so easily...but the bees adore the flowers as do I in all their stages. my mum would say.....one years seed....seven years weed! but how could you call it a weed! Hello Helen. 'Man with the thistle-down hair' - immediately conjures up how he looks. Hello Olivia. I notice the down each year (though it's soon blown away). However, I don't think I've appreciated before the sharp brown beauty of what's left when it's gone. Hello Down by the Sea. It's true. There seems little connection between some summer plants and their autumn/winter manifestations. I find this especially so with chicory. Hello Donna. There were masses of bees on this big thistle in the summer. Hello Patio Patch. 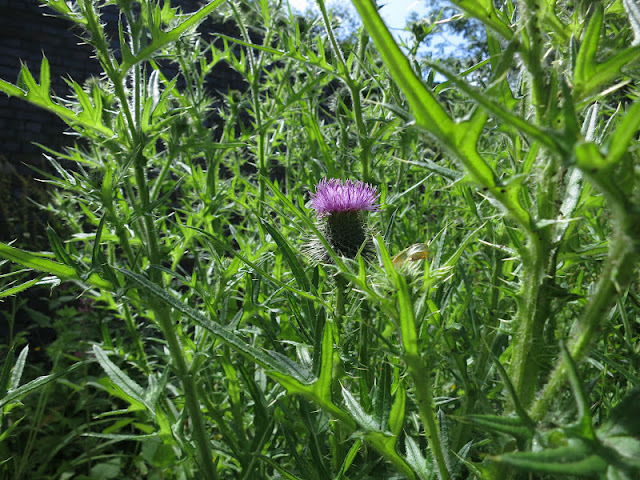 I expect there's some moral parallel between thistles and people - prickly and fluffy all at the same time. Hello Lyn. I much prefer to say 'wild plant'. Then you can say 'one year's seed - a century of flowers'. Sounds better that way! Dear Everyone. You may like to know the next post for Loose and Leafy is published. It's about the way appreciating urban wild plants can help you appreciate urban rubbish too.